The bridal shower card you select is likely to become a treasured keepsake. We often put thought into purchasing the gift, and then pick the greeting card quickly. However, long after the gift is used or gone, the bride often will have kept her cards in a special box with other keepsakes. So, take some time to select this one. Choose a greeting to go along with your gift that is personalized in some way. Think about how this will help add a special meaning to your gift. • Choose one that reinforces your relationship to the bride. It can be lighthearted, or serious. • Gift bags come in all sizes, with small tags attached for signing your name. Although these are acceptable, a handpicked card always seems more special. • Create a personalized bridal shower card at a great price. Tiny Prints Greeting Card Collection shows that a card doesn't have to be expensive to make a statement. They include a range of sentimental to funny. In a matter of seconds you can create a personalized card. Tiny Prints will mail the card directly to you. Then you just sign it, to be included with your gift. This removes the hassle of scouring the rack at your local convenience store for a last minute card. • E-cards are always easy. They just don't seem as personal. • Try to have the saying be appropriate to your relationship with the bride. • Make your own using a special photograph. This could be a family picture, you and the bride, or a group of friends. Then add a simple greeting, or a rhyme that coordinates with the photo. • Add a story about a fond memory you have shared with the bride. This could be how you met, a trip you took together, a funny incident that happened, a holiday tale, etc. • Share a trait or traits that you both have in common. Share ways that you are opposite that have added to your relationship. • You can choose a card that goes along with the theme. • You can select a wedding shower card that uses the party colors. • A special box to store the cards is a thoughtful gift idea for the bride. Memory boxes are sold in different colors and styles. 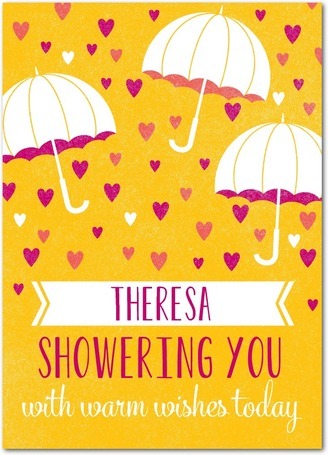 If used the day of the shower, make sure there is some way for the bride to know what gift was given with the card. She'll need this information for sending Thank You notes. • Would you like to go to the homepage?